Charles Quevillon completed his studies in classical guitar and composition at Cégep de St-Laurent in 2008. 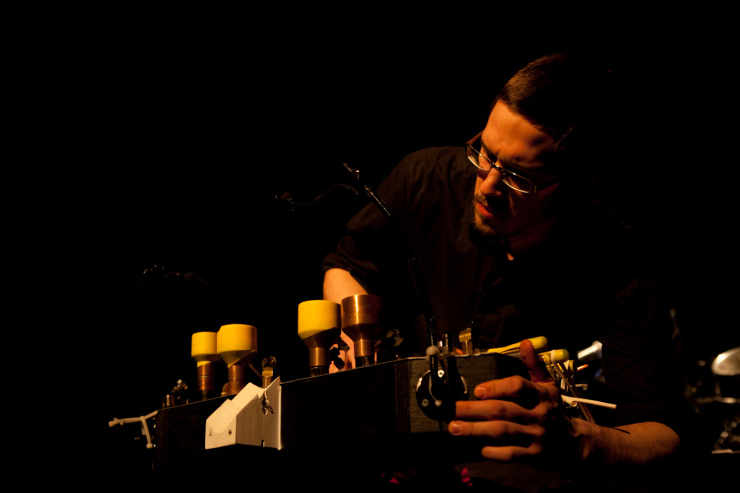 Since then, he has concentrated on electroacoustic and instrumental composition under the guidance of Yves Daoust and Serge Provost at the Conservatoire de musique de Montréal. He participated twice in the Sound Creation Program of the Orford Arts Centre to perfect his work with masters such as Gilles Gobeil, Natasha Barrett, Jean-François Laporte, Lori Freedman, Hans Tutschku and Véronique Lacroix. In addition to his interest in the sonic exploration of the guitar through different mediums such as improvisation and performance, he has also worked in multiple projects in collaboration with directors and choreographers. His work Frette appears on the Cache 2009 compilation and in 2010, his piece Au Boute won 1st Prize in the CEC’s Jeu de Temps / Times Play (JTTP) and 3rd Prize (Hugh Le Caine) from the SOCAN Foundation.